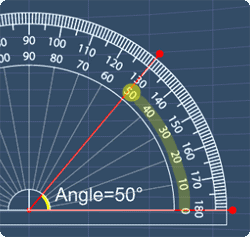 In this lesson, we will learn how to measure angles using a protractor. 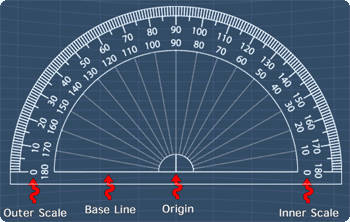 Learn what is a protractor. The following picture shows the parts of a protractor. 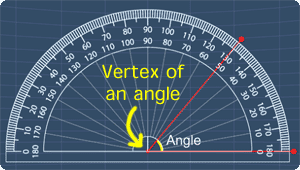 The protractor's origin is at the vertex of an angle. The protractor's base line is along the arm. The math videos below will explain more on this. Using a Protractor - Below 180° from MathExpression.com on Vimeo. 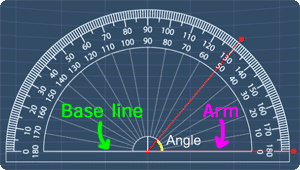 In this lesson, we will learn how to use a protractor to measure angles. Now, this is a protractor. The point here is the 'origin'. This is the base line, the inner scale the outer scale. Knowing this, let's use this protractor to measure angles. Measure this angle, ABC. First, we place the protractor's origin, on the vertex B. Next, make sure that the base line is along the line BC. Looking at the inner scale, we can see that this angle is 70 degrees. Hence, the angle ABC is equals to 70 degrees. Next example, find the value of this angle, ABC. To do so, we place the protractor's origin, on the vertex B. Now, from the inner scale, the angle is measured as, 51, 52, 53, 54, 55 degrees. Hence, the angle ABC is equals to, 55 degrees. Next example, measure the angle, ABC. Similarly, we place the protractor's origin on the vertex B, and make sure the base line is along the line, BC. From the inner scale, we can see that, this angle is 130, 131, 132 degrees. Hence, the angle ABC is equals to 132 degrees. Using a Protractor - More than 180° from MathExpression.com on Vimeo. In this lesson, we will learn on using a protractor to measure any angle that is greater than 180 degrees. Now, measure this angle, ABC. To measure this angle, we split this angle into 2 parts, by drawing a dotted line along BC. By finding the sum of these 2 angles, we will get the angle ABC. Now, we place the protractor, at the vertex B. Next, we rotate the protractor to that its base line is along BC. Here, we can see that, this angle is 180 degrees. Next, to measure this angle, we rotate the protractor, so that its baseline is along the line AB. From the outer scale, we can see that, this angle is 40 degrees. Hence, the angle ABC is equals to 180 degrees, plus 40 degrees. This gives 220 degrees. Therefore, the angle ABC is 220 degrees. By now, we should know that the angle for a full rotation is 360 degrees. Therefore, we can find x, by taking 360 degrees, minus this angle. So, let’s measure this angle using a protractor. To do so, we place the protractor's origin, here. Then, make sure that the base line is along this line. From the outer scale, we can see that this angle is 60, 61, 62, 63, 64, 65 degrees. Hence, x is equals to, 360 degrees, minus by 65 degrees. This gives 295 degrees. That is all for this lesson, try out the practice question to further your understanding. You can start by going through the series of questions on using a protractor or pick your choice of question below.